Happy Guy Fawkes! If...that's an appropriate greeting...well, regardless, be sure to make this Catherine wheel toad in the hole for dinner tonight. You can thank me for it tomorrow. Anyway, in the mean time, it is morning, and that means porridge! Especially on a dreary morning like this. There is no better way to cheer the day than with a warm, creamy bowl of porridge, and this one is especially autumnal. Don't scoff at the wine - the fact is that cooking will burn off most of the alcohol, and you're using so little that it shouldn't matter. I'm a serious light-weight - ask anyone, it's quite severe - but I have never felt anything from this recipe, from Øllebrød, or similar. You will be fine. But, if you are concerned, use plum juice and a little spice instead. Or, for a middle ground, plum cider. Rekorderlig's spice plum cider is actually the best in the world. 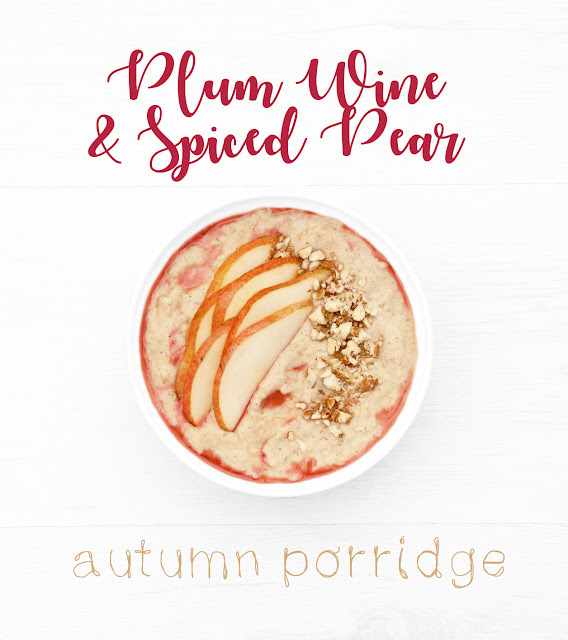 Sweet, spiced and warm, full of vitamins and minerals, this porridge will set you up wonderfully for the day. 1. In a bowl (or shaker bottle) thoroughly combine the oats, whey, spice and sweetener, then, stirring all the while, add the milk (or shake to combine). 3. Move on to step 4 below. To heat, add an additional 50ml water and heat in the microwave for 1 minute, stir, add the warm chopped pear at step 5, then heat again for 20-30 second bursts until desired thickness. 2. In a pan, thoroughly combine the oats, whey, spice and sweetener, then, stirring all the while, add 100ml milk then the boiled water and bring to a boil over medium heat. 3. Reduce to a simmer for 15 minutes or until desired consistency is reached. 4. Meanwhile, chop your pear - I cut mine in half and then cut slices out of the middle, set them aside and then chopped the rest - and drop into another pan with 50ml plum wine. Heat over medium for 10-15 minutes; add a tablespoon more wine if necessary. 5. Once softened, turn off the heat and scoop out the chopped pear, adding it to the simmering porridge, and reserve the remaining warm wine. 6. 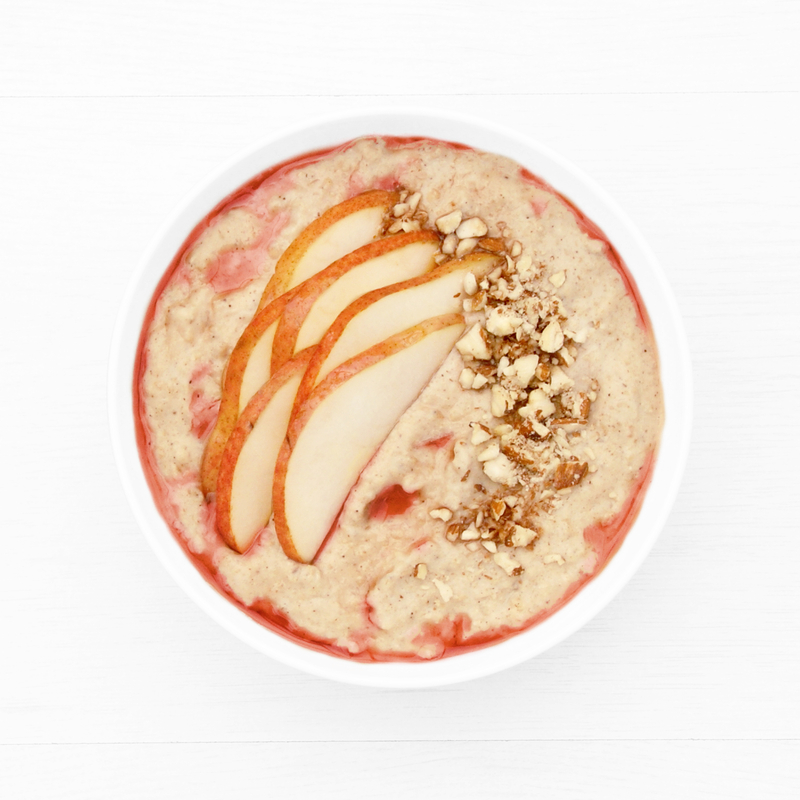 Stir the chopped pears through the porridge and, when desired consistency is reached, transfer to a bowl. Top with pear slices and chopped almonds and drizzle the warm wine over the top of the sliced pears. Serve immediately.